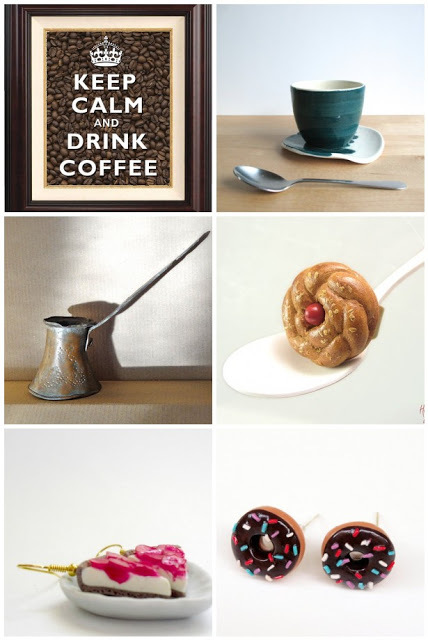 Monday Moodboard – Coffee Lover! Good Morning and Happy New week my friends! This is the last Monday Moodboard, as Estella already mentioned in her blog, so I would like to create something memorable…about friendship, yourself,your joy. Last night I had a really great time with a few new friends and we discussed, laughed, drank… it was super. Since I am a coffee lover and since most of the Greeks have a cup of coffee when they want to see their friends, I created a moodboard full of coffee! Ok… I also have a sweet tooth…and I never drink my coffee without at least a tiny biscuit! So fill up a cup, grab a biscuit or a tsoureki or donut or whatever and enjoy it. It will definitely calm your nerves and it will definitely make you smile! Have a wonderful, full of smiles and happiness week! I love this!! In fact I'm enjoying your post, while drinking my coffee! sweet choices! Goodbye to Monday moodboards, they will be missed..
so lovely! our coffee pot feels great next to the delicious tsoureki ring 🙂 thank you!! This moodboard it's really pretty! Honey you know how I love sweets and coffee, don't you? Those finds are just amazing! these are beautiful creations! Makes me want a cup of coffee with sweets right now!